Major infrastructure stays on fast-track as planning quango closes. A new democratic, fast track system for decision making on major infrastructure projects to support the UK’s return to economic growth was confirmed today (29 June 2010) by Decentralisation Minister Greg Clark. Mr Clark confirmed that the Infrastructure Planning Commission - a quango with the power to approve major infrastructure projects - will be abolished in line with the Coalition Agreement. It will be replaced with a new rapid and accountable system where ministers, not unelected commissioners, will take the decisions on new infrastructure projects critical to the country’s future economic growth. A Major Infrastructure Planning Unit will be established in the Planning Inspectorate to continue fast-tracking major infrastructure projects like offshore windfarms and nuclear power stations. Ministers will take decisions on applications within the same statutory fast-track timeframe as the current regime. In addition, all National Policy Statements, the government’s future infrastructure blueprints, will now be subject to ratification by Parliament. Ministers believe these critically important national documents must have the strongest possible democratic legitimacy. New infrastructure is critical to the country’s return to economic growth and we believe we must have a fast track system for major projects - but it must be accountable. The previous system lacked any democratic legitimacy by giving decision making power away to a distant quango on issues crucial to every community in the country. Today the coalition is remedying those deficiencies by putting in place a new fast track process where the people’s elected representatives have responsibility for the final decisions about Britain’s future instead of unelected commissioners. A fast and efficient planning system is critical for facilitating investment in much needed new energy infrastructure. By abolishing the Infrastructure Planning Commission we will ensure that vital energy planning decisions are democratically accountable. We welcome the government’s clarification that the function of the Infrastructure Planning Commission is to be retained even if the body itself is not. It is critical that there is a specialist body with the skills and expertise to consider proposals for essential major infrastructure projects to allow decisions to be made in the national interest. We believe that people’s confidence in the system will be strengthened by the commitment that final decisions on major infrastructure projects will be taken by the Secretary of State within a defined timeframe. 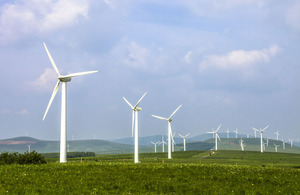 The UK Business Council for Sustainable Energy welcomes the government’s commitment to continuing the streamlining of the consenting process for nationally significant infrastructure projects, which needs to reflect the pressing national need for energy infrastructure and deliver certainty whilst ensuring meaningful dialogue on proposals with communities. New primary legislation will be brought forward to close the Infrastructure Planning Commission. Until it is in place the Commission will continue to consider and determine applications as National Policy Statements are designated to ensure there is no delay in handling applications.